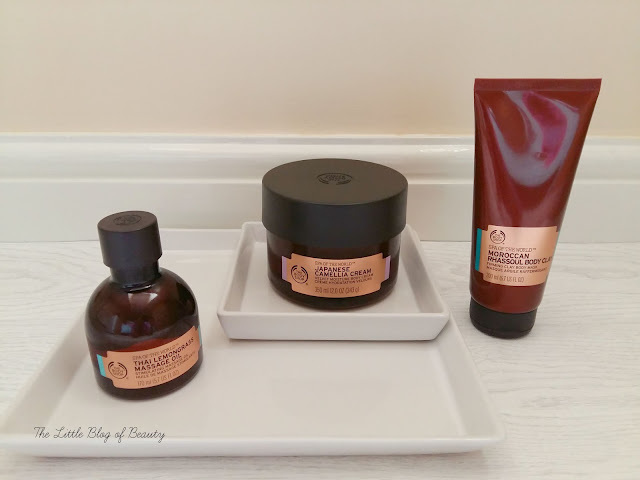 The Body Shop's new Spa of the World range launched on 10th August and I've been sent a few products from the range to try. The products I'll be trying out include the Japanese camellia cream Velvet moisture body cream*, Moroccan rhassoul body clay* and Thai lemongrass massage oil*. I haven't really tried any of these products yet (I'll be reporting back with my thoughts on them in the future) but I wanted to introduce the range to you. This is intended as a luxurious spa brand so the prices do run a little higher than you would usually pay for a product from The Body Shop. I believe TBS are currently overhauling some of their packaging and the Spa of the World range does feature packaging that we haven't seen from them before, running with a gold and deep bronze/golden brown colour scheme. The products available online do appear to be a bit limited but I believe more products may be available in store. I thought there were 'themes' in terms of scent/ingredients across different products but actually it appears that each product is different. The scents/ingredients available include Dead sea salt, Himalayan charcoal, Tahitian orchid, and French lavender and the products include scrubs, bath oils. body masks, body moisturisers and massage oils. The product I'm really intrigued to try is the Moroccan rhassoul firming clay body mask (£16). We're all familiar with clay face masks but I think this may be the first body mask that I have personally come across. There is also a body mask brush (£10) available to use with this which I am tempted by and might pick up if I like the product. I do use a brush to apply clay masks to my face and although you can obviously just use your hands I do prefer using a brush as it's a little less messy. This is designed for the tummy, legs and arms and absorbs excess water and oil to tighten skin and make it feel firmer as it dries. It's not clear whether this 'firmed' feeling is intended to hang around after the product has been washed off but I'm guessing this might be the case. I won't be using this on my tummy or arms, as I'm lucky enough to not need any help in these areas, but I will be trying it out on my legs. I don't really suffer from cellulite but do tend to suffer from 'puffy' legs, which stops me wearing anything above the knee. It recommends removing this with firm circular movements to maximise the firming effect so it might be worth trying this with a body brush. Although I have dry skin I'm not a fan of TBS' body butters as I find them too solid and my skin doesn't absorb them well. I am however a fan of their body lotions (although I've only really tried the Smoky poppy one) as I find these absorb well and quickly and don't leave any horrible stickiness behind. The Japanese camellia velvet moisture body cream (£23) definitely comes in somewhere between the two. It's solid, so not a body lotion, but it has a light, whipped cream feel that is much softer than the body butters. A few years ago I had a moisturiser from a Ted Baker gift set that was described as a body soufflé and I loved it, but it had been discontinued when I went to purchase it. This very much reminds me of that so I'm hoping this might just be my new favourite body product. Finally there's the Thai lemongrass stimulating massage oil (£16). I've mentioned before that a massage oil is something that I've never really had a use for, but I'm actually hoping this might help me out with something. I suffer with Scoliosis, Hypermobility and Bursitis, which means I often experience pain in my joints/muscles. Although I don't think this could really help with joint pain there's a muscle on the top of my left leg that persistently aches and I'm hoping that trying out massaging the area might help improve this. I will report back after I've given this a try. The Body Shop Spa of the World products are now available in stores and online. Have you got your eye on any products from the Spa of the World range? These sound really nice especially the massage oil. Help! Which shade to match my dress?